A.3.1. 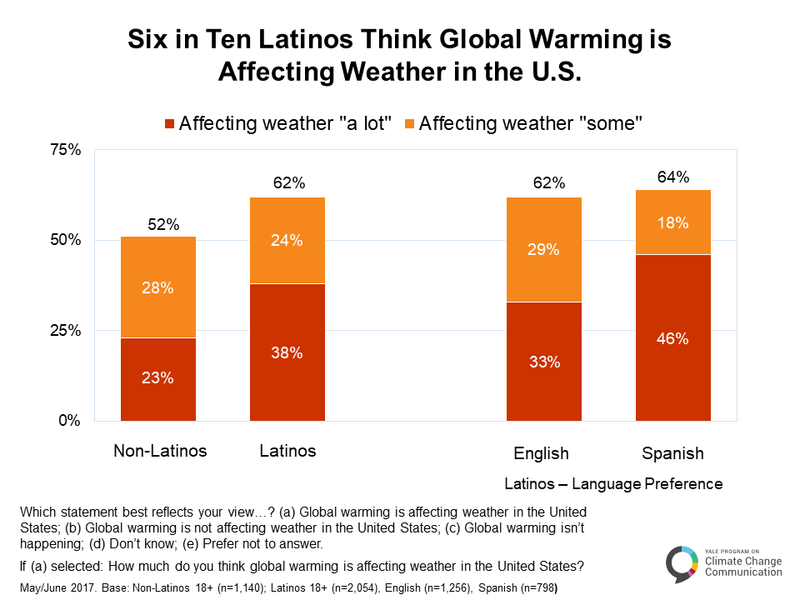 Six in ten Latinos think global warming is affecting weather in the United States. In line with this assessment, six in ten Latinos (62%) think global warming is affecting weather in the United States either “a lot” (38%) or “some” (24%). Nearly half of Spanish-language Latinos (46%) think global warming is affecting the weather “a lot,” compared with only 23% of non-Latinos. A.3.2. Half of Latinos think people in the U.S. are being harmed “right now” by global warming. 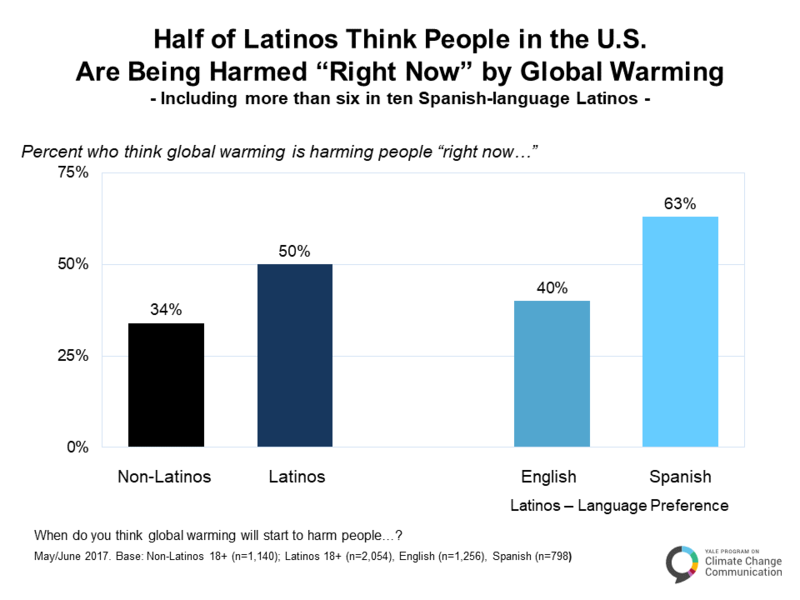 Half of Latinos (50%) think people in the U.S. are being harmed by global warming “right now,” including nearly two in three Spanish-language Latinos (63%). By contrast, only one in three non-Latinos (34%) think people in the U.S. are currently being harmed. A.3.3. 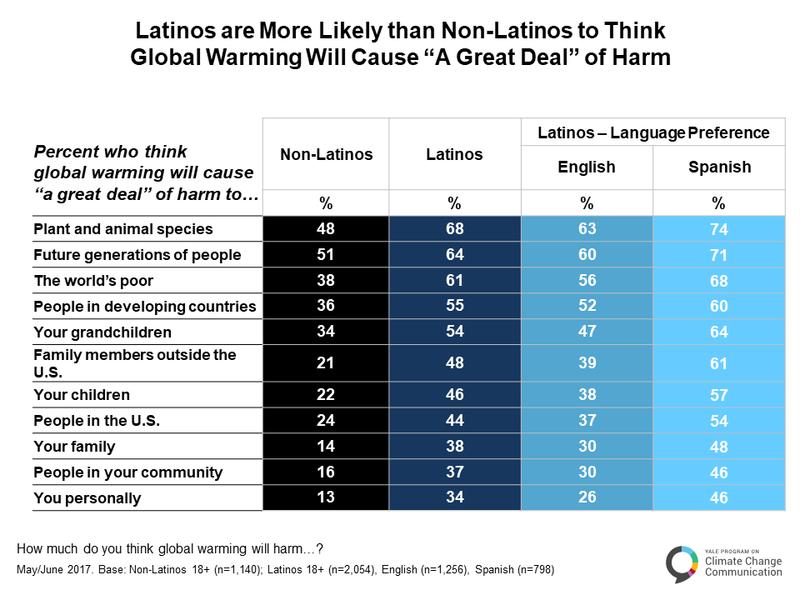 Latinos are more likely than non-Latinos to think global warming will cause “a great deal” of harm. Six in ten or more Latinos think that plant and animal species (68%), future generations of people (64%), or the world’s poor (61%) will be harmed a “great deal” by global warming. A majority also think people in developing countries (55%), or their grandchildren (54%) will experience a great deal of harm. Four in ten or more think family members outside the U.S. (48%), their children (46%), or people in the U.S. (44%) will be harmed a great deal. They are less likely to think that people in close proximity – their family (38%), people in their community (37%), or themselves (34%) will be harmed a great deal. Non-Latinos are much less likely to think global warming will cause a great deal of harm to each group. A.3.4. 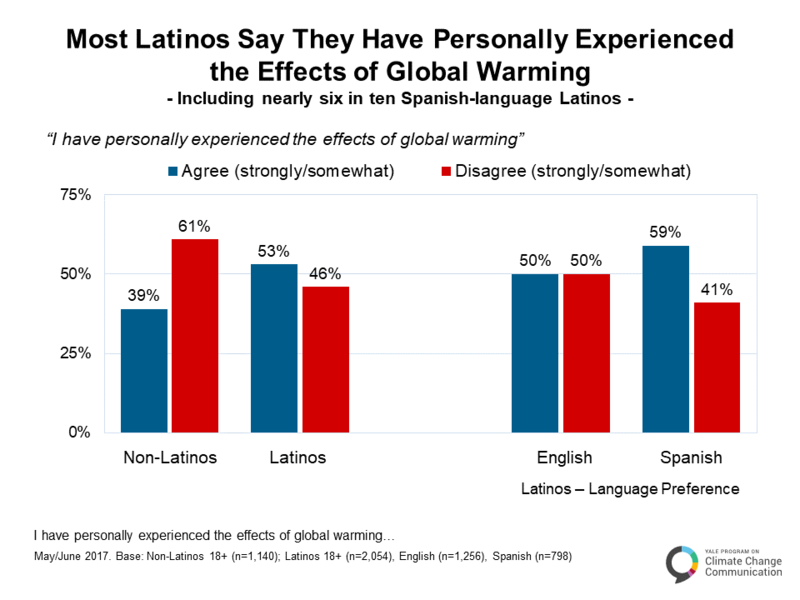 Most Latinos say they have personally experienced the effects of global warming. A majority of Latinos (53%) say they have personally experienced the effects of global warming. Fewer than half (46%) say they have not. Nearly six in ten Spanish-language Latinos (59%) say they have personally experienced the effects of global warming. By contrast, only about four in ten non-Latinos (39%) say they have personally experienced the effects of global warming, while six in ten (61%) say they have not. A.3.5. Twice as many Latinos as non-Latinos have been harmed by extreme heat waves, drought, or polluted air. 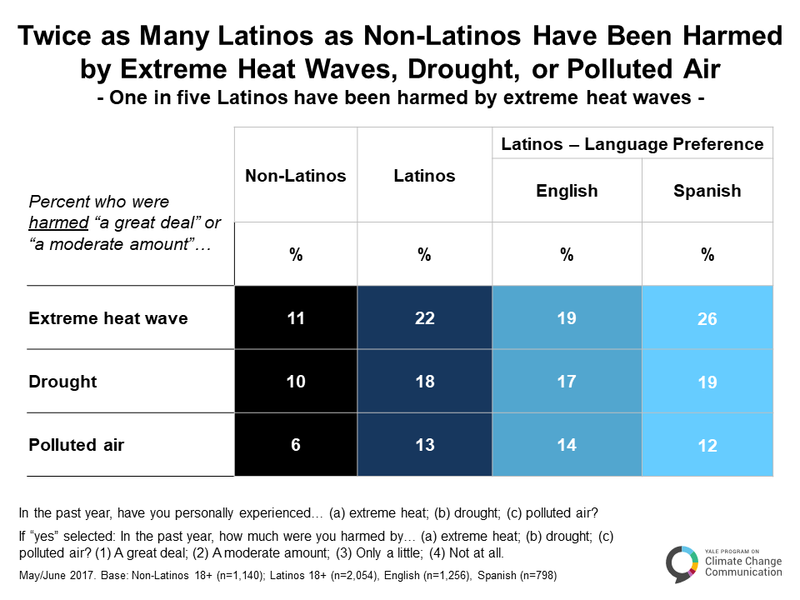 About twice as many Latinos as non-Latinos say they have been harmed at least “a moderate amount” in the past year by extreme heat waves (22% vs. 11%), drought (18% vs. 10%), or polluted air (13% vs. 6%). More than one in four Spanish-language Latinos (26%) say they have been harmed by an extreme heat wave.